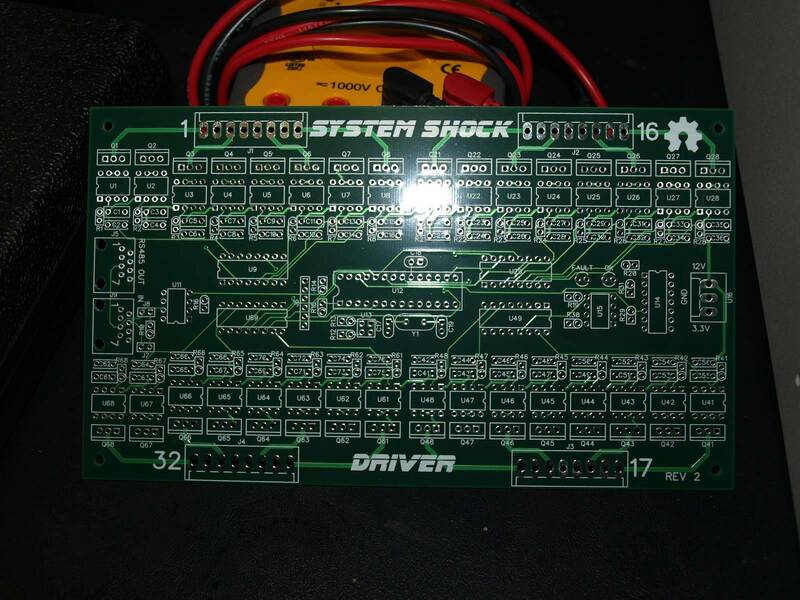 Thought I would do a separate post on my open source control boards, System Shock which I am creating for my Skyrim pin. 128 direct switch inputs, not charlieplexed/multiplexed. Has an eeprom for game settings, config, audits etc. There is a 2 digit error display, also a 48bit unique serial number on each board (would be good for ID'ing a game over the lan when hooked up to a central server to take in game scores, audits and such!) It has a USB plug that is fused with a 2A auto fuse to provide power to the raspberry pi board. This can be the rs485 master board, run the rules etc. The FET driver, 32x individual fets. 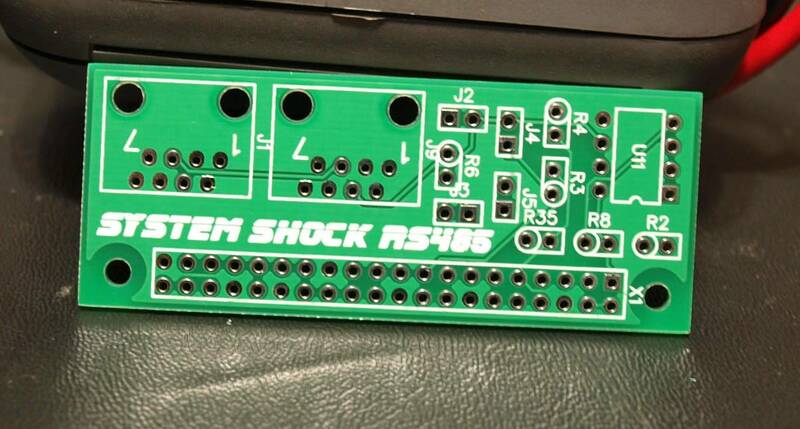 Can be configured to have up to 4 of these boards on the rs485 chain. The RGB Insert driver, can drive 64 individual RGB LED's with complex light shows, fades, all running off its own cpu. 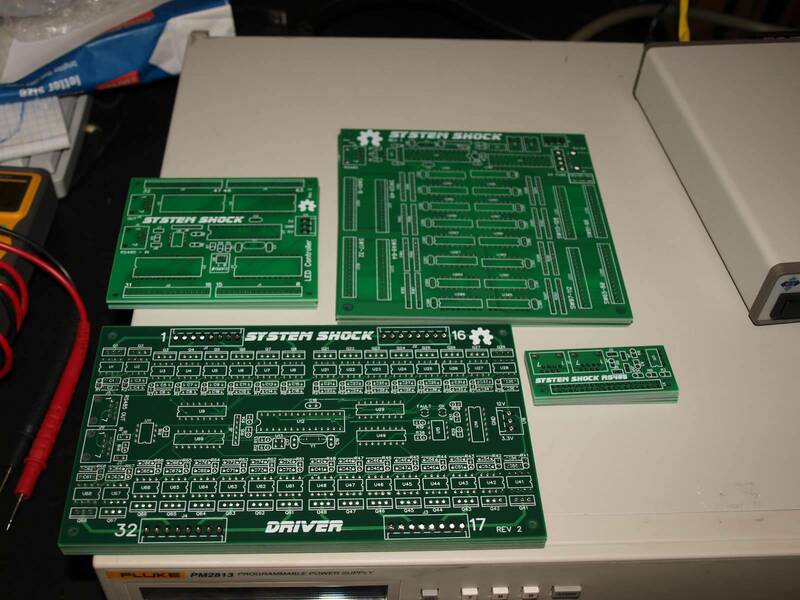 Can have up to 4 of these boards for 256 RGB LED's. These are not chained, so if one goes down it does not take down a string of them. this wee board is the raspberry pi rs485 comms board, it also can be a master. So I've said the word 'master' a few times, the original design had the switch board being the master, it ran the rules, read the switches and pumped the switch info out over the bus for all the child boards to snoop on and act opon, as well as sending other messages out over the bus. It would send messages to the RPI for doing audio/video like PLAY_SONG #1, SET_SCORE 123113300, etc. but the pi comms board was the last board I did and I made it so I could use it outside of this project for other things, so that meant I could make it a master board as well. with the pi being the master board, all the rules could move to here, off the switch driver board. that would make it more flexible for non C coders (the switch board is PIC32, and you need to write the rules in C), since the PI can run whatever (misson etc if I did the port). the only downside there is the switch board would be trying to 'control' the bus more than the master (PI) board would be, and software would need to be written to handle contention of having two boards being able to 'control' the bus. once I've soldered them all up and tested them, then I will push it and the base code to my github. 1) Will these be available to buy? I'd be interested if there was the capability to run MPF on the Pi to drive it. 1) eventually Id love to sell them as like a little kit. Ill have to look into seeing what it would take to port mission over. I'm not a python guy at all, dont like it one bit. c or ruby or death! but ill see if i can find some time to see what mission needs for a port. Basically Mission needs a driver to talk to - so a C program that accepts commands from Mission and passes them to the hardware. I just saw this now from the link on the white wood thread. I'm the guy doing the Mission Framework. It's written to be platform independent with platform modules for each different type of hardware.. so you don't have to "port" anything per se, rather you (or us?) just need to write a platform module. The platform module converts MPF commands into the hardware calls and vice/versa. Pretty much everything you'd expect.. send commands to fire drivers, LEDs, etc. read switches..
For P-ROC/P3-ROC, they have an interface library written in C with a wrapper to expose it to Python which we use. For FAST they have a virtual COM port interface (over USB) so we send/receive serial commands. So for your board, just give me a way to talk to it and I can write an MPF platform interface pretty quickly. I think I did the FAST one in a weekend. Morning Brian, I loosely follow MPF on git and pull it for updates every once in a while. 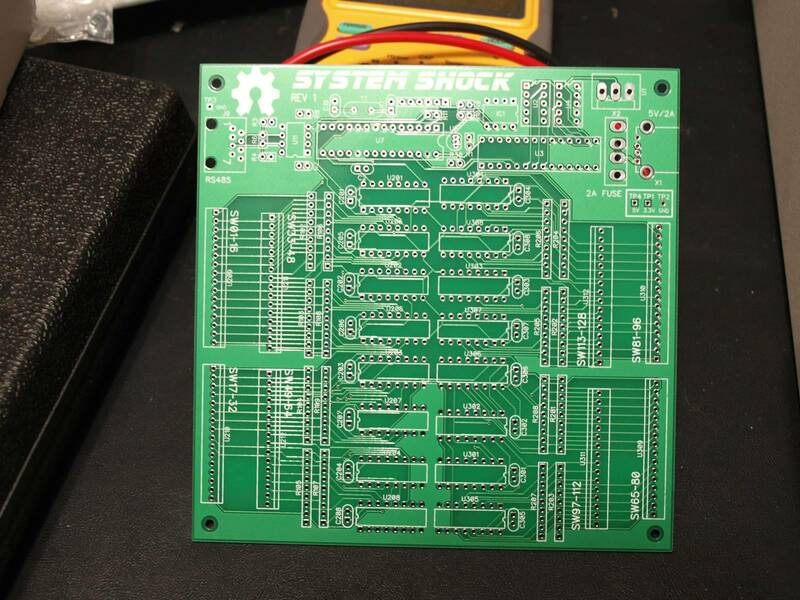 As for system shock boards, each board has its own processor that gets initial configuration on boot up from the master board, then it does its own thing. the solenoid board takes care of pwm'ing the solenoids etc, you basically send a "SX" X being hex number, and the board will either fire it once and be done or fire and pwm it until told otherwise, it also adds a random time to the pulse so its not always the same strength (unless configured to be). 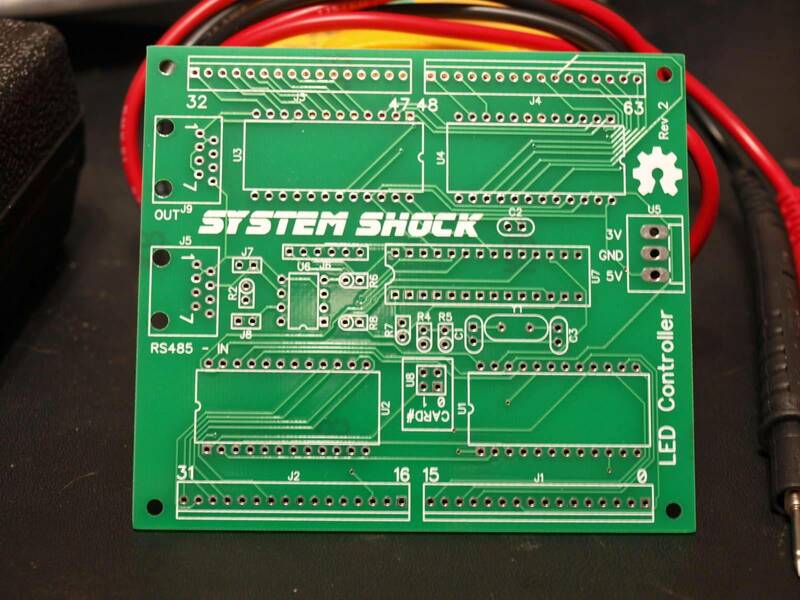 same for the RGB LED boards, send a "L0:0" and light show 0 plays on led 0, and a light show could be a list of 10000 commands (the LED board runs a bytecode interp that does fades/wipes/pauses etc), the switch board (currently the main rs485 master), pumps the switch state over the wire every N times a second, which goes to all child boards. Im going to have to do some code rewrites to try and get the PI to become the master board and get the switch board to be a subordinate and it can request switch state to be sent, that should fix a few things up. With the child boards all having their own processor I'm not sure how much MPF will need to do behind the scenes. are there enough resources on the rpi to use two serial ports? one for just getting data from the switch board and one for just sending data out to the other boards? ?